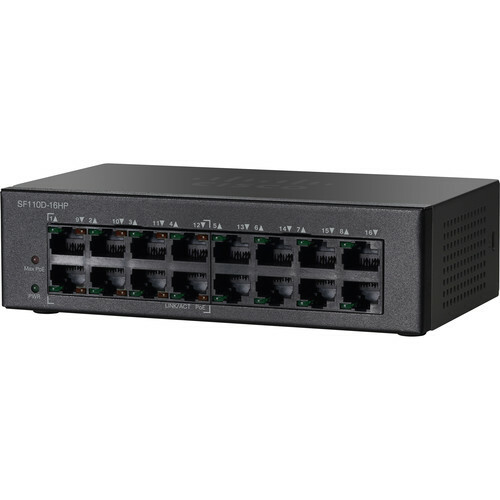 With the SF110D-16HP 110 Series 16-Port Unmanaged PoE Network Switch from Cisco you can connect a variety of Ethernet-enabled devices such as access points, hubs, computers, and more directly to a larger network and to the Internet. Plug-and-play configuration allows you to place it into a rack mount configuration and begin expanding your network capacity right away. This SF110 series switch comes equipped with sixteen Fast Ethernet ports that provide a fast, reliable network connection, and eight of the ports support Power over Ethernet to power a variety of compatible network devices. A switching capacity of 3.2 Gb/s and forwarding capacity of 1.4 Mpps ensures users benefit from increased bandwidth and throughput to move packets through the switch faster and more efficiently. Once installed, this Cisco switch helps to reduce energy consumption as it supports the 802.3az networking standard, which puts unused links within the switch to sleep. For added piece of mind the SF110 switch supports automatic cable detection to eliminate the concern over using the wrong cable and comes compatible with a wide variety of equipment from other vendors. This Cisco 110 Series switch delivers the performance to run business applications, including bandwidth-intensive video services, and avoid slow and sluggish networks. It supports Fast Ethernet speeds, unlocking a new level of capacity and performance in your business network and letting you transfer large files in seconds. This Cisco 110 Series switch is designed to help conserve energy by optimizing power use without compromising performance, which protects our environment and reduces your energy costs. In addition, it supports the Energy Efficient Ethernet (IEEE 802.3az) standard, which reduces energy consumption by monitoring the amount of traffic on an active link and putting the link into a sleep state during quiet periods. Most of the switches have no fans, so they run silently and unobtrusively while lowering energy costs. This switch includes advanced Cisco traffic-handling features to keep your applications running at peak performance. Integrated QoS intelligence on all models automatically prioritizes delay-sensitive services such as voice or video to improve your network's performance. Loop detection helps discover loops in the network that you might have accidentally created, thus avoiding broadcast storms that will bring your network to a stall. Cable diagnostics help to quickly identify and troubleshoot network cabling faults and issues. Fast store-and-forward switching identifies damaged packets and prevents them from being passed on through the network. All of these features run automatically, with no management or configuration required. Box Dimensions (LxWxH) 12.7 x 9.3 x 2.2"